King Richard III Events | Upcoming King Richard III Events in Leicester. Upcoming King Richard III Events in Leicester. 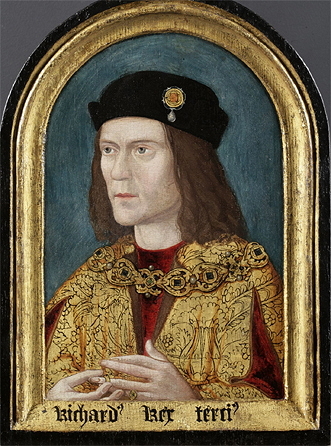 King Richard III earliest surviving portrait. This website is dedicated to providing information on King Richard III Events and Activities in Leicester leading up to the reinterment of the misunderstood King in 2014. On 24 August 2012, the University of Leicester and Leicester City Council, in association with the Richard III Society, announced that they had joined forces to begin a search for the remains of King Richard. Led by University of Leicester Archaeological Services (ULAS), experts set out to locate the lost site of the former Greyfriars Church (demolished during Henry VIII’s dissolution of the monasteries), and to discover whether his remains were still interred there. By comparing fixed points between maps in a historical sequence, the search located the Church of the Grey Friars, where Richard’s body had been hastily buried without pomp in 1485, its foundations identifiable beneath a modern-day city centre car park. The University of Leicester confirmed on 4 February 2013 that a skeleton found in the excavation was, beyond reasonable doubt, that of Richard III, based on a combination of evidence from radiocarbon dating, comparison with contemporary reports of his appearance, and a comparison of his mitochondrial DNA with two matrilineal descendants of Richard III’s eldest sister, Anne of York.